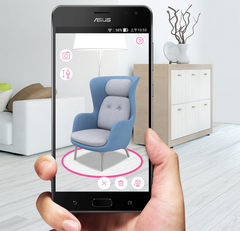 Asus are doing a good job of bringing us closer to the future with each device. The Zenfone AR finally went on sale and it's an absolute beauty. We recently reported the possibility of a June 14 release for the Asus Zenfone AR. We reported right, as the device finally went on sale. The Zenfone AR was launched in January as the first Android device with 8GB of RAM, a title that meant close to nothing as the device only just became available to the general public today. The Nubia Z17, however, was released a few weeks ago and will be known as the first Android device to actually carry 8GB of RAM. The Zenfone AR, the closest thing to a futuristic phone we'll be getting for now, is a breath of fresh air, as it brings a lot more than the standard flagship specifications sheet to the table. There are two sides to that, though, as the device retails with a rather impressive price tag of $825. The aforementioned Nubia Z17, in comparison, retails for about $600. That may just be an unfair comparison, however, as the Zenfone AR offers a lot more than the Z17. It would be more appropriate to compare it to flagships like the Sony Xperia XZ Premium, and that sells for about $800. Asus' new device supports Tango and Daydream by Google, and is built with an emphasis on Augmented Reality (AR) and Virtual Reality (VR). It also carries a Tricam system which consists of three rear cameras—"a motion tracking, depth sensing, and high-resolution 23MP camera — that enable the phone to a create a three-dimensional model of its surroundings and track its motion, so it can see the world just like you do." It sports a 5.7" Super AMOLED QHD display, Gorilla Glass 4, 8GB of RAM, Snapdragon 821, and of course, a headphone jack. What's not to like?